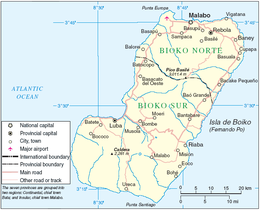 Bioko (spelled an aa Bioco, in Europe tradeetionally cried Fernando Pó) is an island 32 km aff the wast coast o Africae, specifically Cameroon, in the Gulf o Guinea. It is the northrenmaist pairt o Equatorial Guinea wi a population o 260,000Template:Reference needed an an aurie o 2,017 km2 (779 sq mi). It is volcanic wi its heichest peak the Pico Basile at 3,012 m (9,882 ft). This page wis last eeditit on 17 Februar 2016, at 22:06.